The rapid technological revolution, globalization of business, etc. are bringing about dramatic changes in our working environment. In response to these challenges, Ricoh aggressively pursues R&D in the following 4 areas: Environment, Printing, Office Solutions, and Devices, as we support our customers’ new workstyles and business models while helping to solve environmental problems. 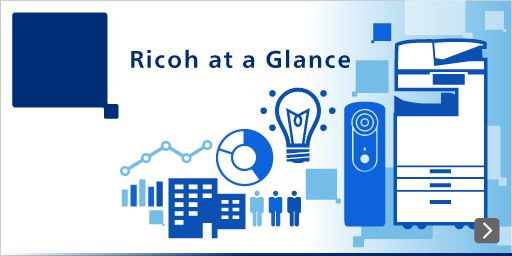 We also focus on R&D in common Fundamental Technologies that support Ricoh products and business. By improving fundamental and manufacturing technologies with an eye on the future, we contribute to quality stabilization of products and also aim at realizing an enriched society. In conclusion, our core and fundamental technologies reflecting our accumulated know-how as a manufacturer form the basis for what we broadly call Industrial Solutions. Please visit "Innovations (by field)" to learn more about individual technologies by field. Technologies that aim at energy, resource conservation, recycling, and pollution prevention, reducing environmental impact in each life-cycle stage of Ricoh products. Technologies for printing such as MFPs and printers in office and professional-quality printing markets, printed electronics, and rewritable printing. Technologies that facilitate efficient and smooth collaboration, and support workstyle innovation to improve intellectual productivity. Technologies related to various devices that provide new value by utilizing core technologies such as optics, image processing and control. Advanced element technologies related to development of materials and processing method, and analysis / simulation technologies for improving product design and production efficiency. Industrial innovations based on technologies accumulated over time and developed through continuous improvement in manufacturing, for FA, logistics and production.